Humans and Neanderthals may have interacted in Spain in southwest Europe, according to the art on the cave wall. According to the authors, "The south of Iberia conserves an important group of Palaeolithic rock art sites. The graphisms have been mostly attributed to the Solutrean and Magdalenian periods, while the possibility that older remains exist has provoked extensive debate. This circumstance has been linked to both the cited periods, until recently, due to the transition from the Middle to Upper Palaeolithic in the extreme southwest of Europe as well as the non-existence of some of the early periods of Palaeolithic art documented in northern Iberia"
Their study presents the results of interdisciplinary research conducted in Las Ventanas Cave. These results enabled us to identify a new Palaeolithic rock art site. The technical, stylistic and temporal traits point to certain similarities with the range of exterior deep engravings in Cantabrian Palaeolithic rock art. Ventanas appears to corroborate the age attributed to those kinds of graphic expression and points to the early arrival of the Upper Palaeolithic in the south of Iberia. Importantly, the results provide information on the pre-Solutrean date attributed to trilinear hind figures. These findings challenge the supposed Neanderthal survival idea at one of the main late Middle Palaeolithic southern Iberian sites (Carigüela) and, due to the parallels between them and an engraving attributed to this period in Gibraltar, it raises the possibility of interaction between modern humans and Neanderthals in the extreme southwest of Europe. The Centro Nacional de Investigación sobre la Evolución Humana (CENIEH) has participated in a study led by the Universidad de Sevilla and published in the journal PLOS ONE, on the Paleolithic engravings in the cave Las Ventanas , one of the highest sites (at 1015 meters) where rock art has been found in the Iberian Peninsula. Landscape of Andalusia, view from the caves of Las Ventanas, Pinar. 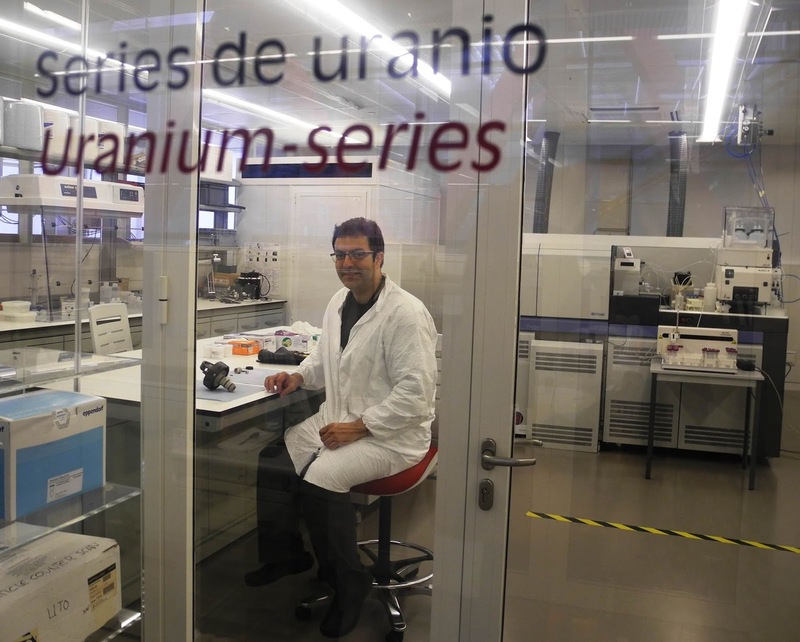 The Uranium Series Laboratory of the CENIEH has collaborated in establishing the chronological framework, and an age of 35,000 years has been confirmed for the oldest rock art found in this cave in the province of Granada, situated in the Sierra de Arana (Píñar). “The dates we have obtained at the CENIEH, using multi-collector plasma source mass spectrometry, confirm the results of the carbon-14 analysis, using accelerator mass spectrometry, helping to underpin the ages calculated", comments Fernando Jiménez Barrido, from the Uranium Series Laboratory. Specifically, two groups of engravings of different ages have been found: one dating from between the end of the Pleistocene and the start of the Holocene (8,500 – 15,000 years ago), and another going as far back as 35,000 years. The technical and thematic “proximity” between the hundreds of engravings in this cave may open up, with all due caution, a way of identifying possible interactions between modern humans and Neanderthals. Cortés-Sánchez M, Riquelme-Cantal JA, Simón-Vallejo MD, Parrilla Giráldez R, Odriozola CP, et al. (2018) Pre-Solutrean rock art in southernmost Europe: Evidence from Las Ventanas Cave (Andalusia, Spain). PLOS ONE 13(10): e0204651. https://doi.org/10.1371/journal.pone.0204651 .